William Stanley Mazeroski (born September 5, 1936), is an American former Major League Baseball (MLB) second baseman. Nicknamed "Maz", he spent his entire 17-year career playing for the Pittsburgh Pirates, from 1956–72. He was elected into the National Baseball Hall of Fame in 2001. Mazeroski is regarded as one of the greatest defensive second basemen of all time. He was an All-Star for seven seasons[lower-alpha 1]and a Gold Glove Award winner for eight seasons. He was a key member of the Pirates' World Series-winning teams in 1960 and 1971, and is perhaps best known for his walk-off home run in the bottom of the ninth inning in game 7 of the 1960 World Series—the only game 7 walk-off homer in World Series history. Mazeroski was noted for his defensive prowess and earned his first of eight Gold Glove Awards in 1958. He had a career .983 fielding percentage, led the National League in assists nine times, and holds the MLB record for double plays by a second baseman. Baseball analyst Bill James has written that "Bill Mazeroski's defensive statistics are probably the most impressive of any player at any position". While his defensive ability typically overshadowed his contributions with a bat – Pirates broadcaster Bob Prince used to call him simply "The Glove" – Mazeroski had several fine offensive seasons. His best was in 1958, when he batted .275, hit 19 home runs (a career best), had 68 RBIs, good enough that along with his sterling mitt he was considered for the MVP Award. In 1966 he knocked in 82, a career best. During his peak (1957–68), he drove in more runs than any other middle infielder of the period. Mazeroski's power numbers were held down by the distant fences in Forbes Field. In his career, he hit over twice as many home runs on the road as he did in his home park – 45 home runs at home versus 93 on the road. By comparison, the Chicago Cubs slugging second baseman Ryne Sandberg hit only 118 of his 282 career home runs away from the comfy confines of Wrigley Field. 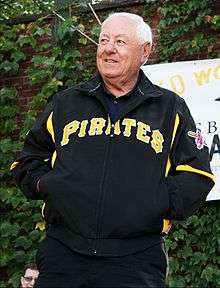 In the 1960 World Series, Mazeroski won the title for Pittsburgh in Game 7 with a game-winning home run off New York Yankees pitcher Ralph Terry in the bottom of the ninth inning. The Yankees had rallied with two runs to tie the game, 9-9, in the top of the inning, setting up Mazeroski's heroics. A 14-year-old fan named Andy Jerpe retrieved the ball outside the ground and had it signed by Mazeroski, but it was later lost when used in a game. Mazeroski and Roberto Clemente were the last remaining Pirate players from the 1960 World Series winners, when the Pirates won the World Series in 1971 and lost the NL championship series in 1972. 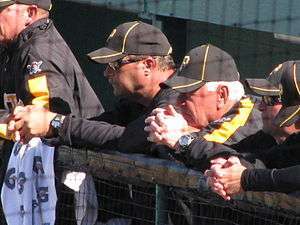 Mazeroski was a member of ex-teammate Bill Virdon's coaching staff with the Pirates in 1973, a year after retiring from playing. 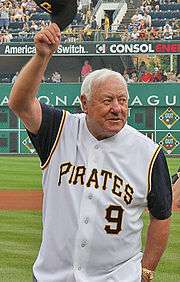 Bill Mazeroski's number 9 was retired by the Pittsburgh Pirates in 1987. Today, a portion of the brick right field wall from Forbes Field remains standing on the University of Pittsburgh campus in Pittsburgh's Oakland District as a memorial; locally, the wall is usually referred to as "Mazeroski's Wall." Although this is technically not the actual section of wall that Mazeroski's famous home run cleared, a nearby plaque in the sidewalk of Roberto Clemente Drive does mark the spot where the sudden-victory homer cleared the wall. A Little League Softball field dedicated to Mazeroski lies on the other side. In 1995, Harrison Central High school, located in Cadiz Ohio had a field donated by Bill which would later be known as "Mazeroski Field"
1 2 The Ultimate Walk-Off. si.com archive, retrieved April 7, 2016. ↑ "Former Point Breeze teen still wonders about lost Mazeroski ball". Pittsburgh Tribune. September 19, 2010. Archived from the original on September 23, 2010. Retrieved September 21, 2010. ↑ Westcott, Rich (2001). Great home runs of the 20th century. Temple University Press. ISBN 1-56639-858-4. ↑ "Archived copy". Archived from the original on September 28, 2013. Retrieved 2013-09-28. "'60 Series film found in Crosby's cellar". FoxSports.com. Associated Press. September 24, 2010. Archived from the original on September 27, 2010. Retrieved 2010-09-24.